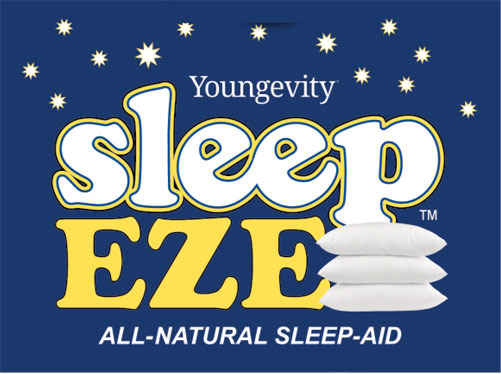 All-natural Sleep EZE™ is formulated with a proprietary blend of herbs (passion flower, valerian, lemon balm, chamomile and hops) and other natural substances to support a healthy, restful sleep. If this sounds like you, all new Sleepeze from Youngevityy can help. This all natural sleeep aidis specially formulated with natural substances and a propriortary herbal blend to promote a restful, relaxed state. Stop dreaming of the day when you finally wake up feeling rested and refreshed. 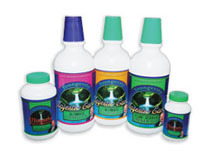 Enjoy a healthful sleep and start your day with feeling energized and alert with . . . .
Sleep EZE™ is specially formulated with natural substances and a proprietary herbal blend to promote a restful relaxed state. * Key ingredients include: • 5-HTP (L-5-Hydroxytryptophan) / 5-HTP works in the brain and central nervous system by increasing the production of the chemical serotonin which can affect sleep temperature appetite and other functions. • GABA (Gamma-Aminobutyric Acid) / GABA is a naturally-occurring chemical known to affect mood. Low levels of GABA are associated with sleeplessness. • Melatonin / This hormone may help you fall asleep faster and promote a healthy sleep-wake cycle. • B Vitamins / Niacin may promote relaxation and is derived from tryptophan an amino acid important for maintaining healthy sleep. Vitamin B6 is important for synthesizing GABA. 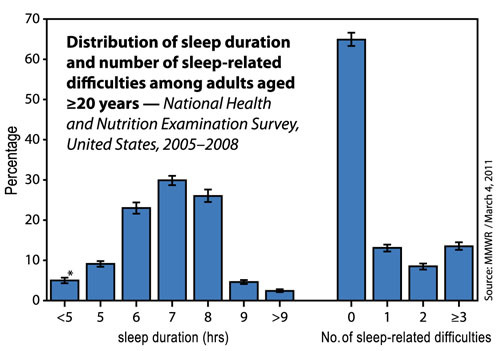 • Calcium and Magnesium / Deficiencies of these key minerals have been associated with poor sleep. • Proprietary Herbal Blend / Passion flower valerian lemon balm chamomile and hops have been traditionally used to support a healthy restful sleep. DIRECTIONS: Take 2 capsules 30 minutes before bedtime or as directed by your healthcare professional. WARNING: If you are pregnant nursing or taking medications consult your physician before using this product. FOR USE BY ADULTS ONLY. KEEP OUT OF REACH OF CHILDREN. 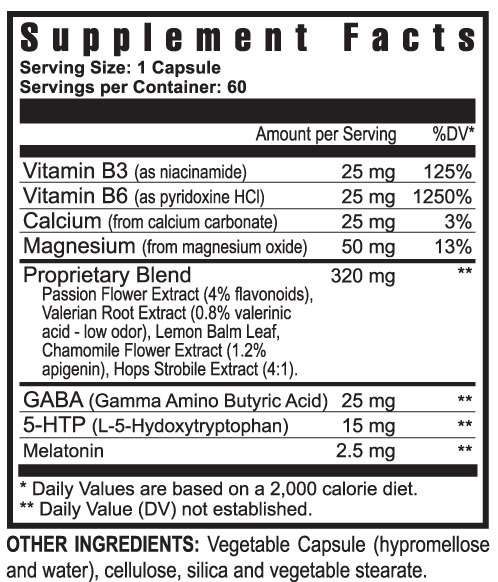 Ingredients: Vitamin B3, Vitamin B6, Calcium, Magnesium, Proprietary Blend, Passion Flower Extract (4% flavonoids), Valerian Root Extract (0.8% valerenic acid - low odor), Lemon Balm Leaf, Chamomile Flower Extract (1.2% apigenin), Hops Strobile Extract (4:1), Passion Flower Extract (4% flavonoids), Valerian Root Extract (0.8% valerenic acid - low odor), Lemon Balm Leaf, Chamomile Flower Extract (1.2% apigenin), Hops Strobile Extract (4:1), Vegetable Capsule (hypromellose and water), cellulose, silica and vegetable stearate.